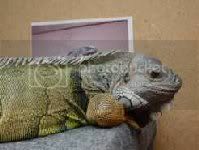 Love is where your Iguana is! A little blurry, but from the bulge in the first pic, I'm going to say that your guess is correct. I'm not voting yet either...but I have voiced my guess in another thread...and I'll stick with that one. Boy... .
Not really too much clearer but all the same from what I am seeing it still looks a bit too early to tell. Could go either way...Although, the "bulging" that I'm seeing still keeps me in the mind of male.